Manaslu also known as Kutang is the eighth highest mountain in the world at 8,163 meters above sea level. It is located in the Mansiri Himal, part of the Nepalese Himalayas, which means "mountain of the spirit". Manaslu was first climbed on May 9, 1956 by Toshio Imanishi and Gyalzen Norbu, members of Japanese expedition. The mountain's long ridges and valley glaciers offer feasible approaches from all directions, and culminate in a peak that towers steeply above its surrounding landscape, and is a dominant feature when viewed from afar. The Manaslu region offers a variety of trekking options. Manaslu Circuit is one of the classic treks in Nepal around Manaslu, The popular trekking route of 177 km, skirts the Manaslu massif over the pass down to Annapurna. The Nepalese Government only permitted trekking of this circuit in 1991 with Restricted Area Permit and that trekkers travel in a group of two with a registered guide. In route, 10 peaks over 6,500 meters are visible, including a few over 7,000 meters. The highest point reached along the trek route is the Larkya La at an elevation of 5,106 meters. As of May 2008, the mountain has been climbed 297 times with 53 fatalities. This trek would appeal to anyone who is looking for a challenging trek in a remote region of the Nepal Himalaya. The trail passes through a geographically spectacular and culturally fascinating area with scenery similar to the classic Annapurna Circuit although the trails are not as popular with trekking groups. The trek starts at the town of Arughat passing through bamboo forests and Gurung villages in the narrow Budi Gandaki gorge. After Lho village we enter the Nupri region inhabited by Tibetan immigrants where you will see colourful prayer flags, mani walls and monasteries along the way. After Samdo village we start the approach towards the Larkya La pass, crossing this high Himalayan pass is a challenging day although would be a good objective for a fit hill walker with no previous mountaineering experience. The view from the Larkya La is superb where we will see Himal Chuli, Manaslu, Cheo Himal and Himlung Himal mountains. This is a geographically spectacular and culturally fascinating trek passing from the Gurung villages of the lower hills to the Tibetans of the upper Budi Gandaki. Larkya La at 5,213m is an impressive Himalayan pass to cross, it is a long day however would be a good objective for most hill walkers. Manaslu Circuit would appeal to anyone looking for a challenging trek in a remote region of Nepal visited by relatively few other trekkers. Day 07:Trek to Namrung (2,540m)- 7 hours walking. Day 08:Trek to Lho (3,020m)- 4 hours walking. Day 09:Trek to Samagaon (3,450m)- 4 hours walking. Day 10:Day walk from Samagaon (3,450m). Day 11:Trek to Samdo (3,860m)- 3 hours walking. Day 12:Day walk from Samdo (3,860m). Day 13:Trek to Larkya Phedi (4,460m)- 3 to 4 hours walking. Day 14:Cross the Larkya La (5,135m), trek to Bimtang (3,590m)- 7 to 8 hours walking. Day 15:Trek to Dharapani (1,860m)- 7 to 8 hours walking. Day 16:Trek to Jagat (1,430m)- 6 hours walking. Day 17:Jeeps to Besisahar then by private vehicle to Kathmandu. Day 3Drive to Soti Khola (700m) - 8 to 9 hours driving We leave Kathmandu early in the morning by private vehicle. It is a scenic drive with several picturesque gorges and occasional glimpses of mountain peaks. After exiting the Kathmandu valley we drive along the Pokhara road following Trishuli River until we turn off to heading north following Budi Gandaki to Arughat Bazaar. After Dhading Besi the road is not sealed so it is likely to be quite dusty in the bus so it is a good idea to bring a buff or scarf along with you. The road has recently been built beyond Arughat so these days we continue the drive in the bus or change to local jeeps for the drive to Soti Khola. This village is a better trailhead than Arughat and it saves a day walking along the dusty road. Overnight at Soti Khola, Meals: Breakfast, Lunch, Dinner. Day 4Trek to Machha Khola (930m) - 6 hours walking Our route heads northwards following the Budi Gandaki river passing through terraced fields and forests with troops of monkeys. After Soti Khola the trail ascends on the valley sides and then descends later to walk along the river. There is an ascent to the village of Macha Khola. During the months of both April and October it will very hot and humid with temperatures often more than 30 Degrees Celsius for the first three days of the trek. These dates have been chosen for optimal conditions in crossing the high passes however please be aware of the hot start to the trek. It is important to bring plenty of water, wear a sun hat and apply sun cream. Overnight at Machha Khola, Included meals – breakfast, lunch, dinner. Day 5Trek to Jagat (1,440m) - 7 hours walking You follow the Budi Gandaki river climbing up and down a number of ridges passing through the villages of Khorlabesi and Tatopani. After crossing the bridge over to east bank of Budi Gandaki you continue through forest to Dobhan. Further along you cross the bridge over Yaru khola (river) then shortly after cross another bridge over Budi Gandaki over to Jagat village. Overnight at Jagat, Included meals – breakfast, lunch, dinner. Day 6Trek to Deng (1,860m)- 7 hours walking After Jagat you cross a bridge over Dudh Pokhari khola (river) then pass through the villages of Salleri and Sirdibas. The trail then descends to cross the bridge over Budi Gandaki to the larger village of Philim. At Philim there is a check point to enter Tsum Valley where our permits will be reviewed. We continue onwards to stay at Deng and enter this village through a Buddhist stone arch known as a Kani. Overnight at Deng, Included meals – breakfast, lunch, dinner. Day 7Trek to Namrung (2,540m)- 7 hours walking. A short distance out of Deng, the trail crosses back over the Budi Gandaki onto what is now its north bank near Rana. From the bridge the trail climbs a little before heading west on level ground and passing a large waterfall. Once over a wooden bridge, the trail contours up and out of the canyon and climbs high above the river before dropping into the Shringi Khola Valley. After the suspension bridge over the Shringi Khola there is a steep climb and the trail traverses along the Budi Gandaki as it flows between vertical walls of rock. After a few more ups and downs through forests, the trail turns a corner and arrives at Ghap through an intricate kani with well-preserved paintings and elegant mani wall. After leaving Ghap, you pass more mani walls on the southern side of the river before heading into some woods. The trail climbs along the river, past a waterfall and continues through deep fir and hododendron. The trail makes a long climb through bamboo and rhodhodenron and finally enters Namrung through another stone archway. Overnight at Namrung, Included meals – breakfast, lunch, dinner. Day 8Trek to Lho (3,020m)- 4 hours walking. Today is a shorter day as we need to limit our increases in altitude in order to have time to acclimatise. Not long after leaving Namrung we arrive to Banjam with its wide fields. Soon after Banjam the trail steeps as we walk up to the next village of Lihi with a fine view of Ganesh Himal. A further hour along the trail we arrive to Sho and then followed by another hour to Lho. From this village there are fine views of Manaslu and the Kutang Himal. In the afternoon it would be worth visiting Ribang Gompa overlooking the village as well as exploring the stupas, mani walls and kani gateway. Overnight at Lho, Included meals – breakfast, lunch, dinner. Day 10Day walk from Samagaon (3,450m). We spend two nights at Samagaon to help acclimatisation. There is a good day walk with views of Manaslu and Peak 29. Overnight at Samagaon, Included meals – breakfast, lunch, dinner. Day 11Trek to Samdo (3,860m)- 3 hours walking. Follow the Budi Gandaki northwards to a bridge over a side stream where the trail forks: the left leading towards the Manaslu Base Camp, the other passing several mani walls heads for the Larkya La. The valley widens along an easy trail past juniper and birch forest to the stone huts at Kermo Kharka, then drops off a shelf to cross a wooden bridge and climbing between a fork in the river to a promontory. From this vantage point, we can see white stone kani marking entrance to Samdo. Overnight Overnight at Samdo, Included meals – breakfast, lunch, dinner. Day 12Day walk from Samdo (3,860m). We spend two nights at Samdo to help acclimatisation. There is a good day walk towards Gya La which is the trading pass with Tibet. Overnight at Samdo, Included meals – breakfast, lunch, dinner. Day 13Trek to Larkya Phedi (4,460m)- 3 to 4 hours walking. Today we start the ascent to the pass by descending through fields to an old mani wall and stone arch before dropping to the river and crossing on a wooden bridge. This place shows up on maps as the mythical Larka Bazaar, which used to be a flourishing market, but there is nothing remaining there now. Another mani wall marks the beginning of ascent to the pass where the trail starts climbing through tundra and juniper; the huge Larkya Glacier coming from Manaslu can be seen from here. Stay on the ridge to the right to find a trail that crosses over the top of two ravines. The trail grows steeper, climbing up the side of a gorge to a viewpoint at the edge of a huge gorge at 4000m. Nearing the Larkya Glacier, we reach Larkya Phedi, where there is a small lodge, built to serve travellers crossing the Larkya La which lies now just ahead. Overnight at Larkya Phedi, Included meals – breakfast, lunch, dinner. Day 14Cross the Larkya La (5,135m), trek to Bimtang (3,590m)- 7 to 8 hours walking. The trail starts as a long gentle climb across moraine, it descends a little to a lake and then becomes rough and indistinct as it crosses to the south of steep grassy slopes. The trail stays on the moraine to a ridge marked by two cairns, from here the prayer flags marking the pass are visible. Descend to the four frozen lakes then make the final steep climb to the pass. On the descent from the pass the trail follows the top of the moraine to the west and makes a set of steep, rough switchbacks as it crosses the moraine then descends more gently on loose gravel to another grassy moraine at 4,450m. The conditions for crossing the pass vary depending on time of year however in case it is icey we should have micro crampons. Please take a look at our kit list in the Appendix. The trail now becomes easier to follow and reaches a small meadow and spring at 4,080m. The valley becomes wider as the trails heads down to a large meadow, past a mani wall and a small rest house that marks Bimthang at 3,590m. Overnight at Bimtang, Included meals – breakfast, lunch, dinner. Day 15Trek to Dharapani (1,860m)- 7 to 8 hours walking. The trail drops to a glacial stream, the headwaters of the Dudh Khola, and crosses a wooden bridge and descends into pine and rhododendron forest to Hompuk at 3,430m. The trail improves as it descends to a fork in the river and then follows the river to a stable at 3030m. Not far from here you reach Karche's fenced fields, then cross a landslide before making a steep climb to a ridge decorated with prayer flags. It makes a descent to the river bank at Gho. The trail continues through fields and intermittent stands of rhododendron and oak to arrive at Tilje, a large Gurung village. Exit the village through a stone arch, cross the Dudh Khola and follow along its embankment descending through scrub forest. The walls of the Marsyangdi Valley loom larger and finally the houses of Dharapani appear in the distance. Pass through Thonje via a wooden bridge and through a chorten-shaped arch, and Dharapani lies across a long suspension bridge over the Marsyangdi. Overnight at Dharapani, Included meals – breakfast, lunch, dinner. Day 16Trek to Jagat (1,430m)- 6 hours walking. 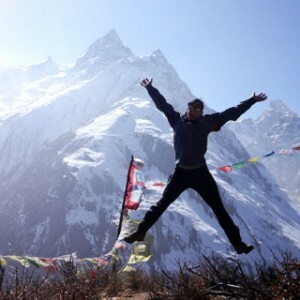 From Dharapani you are now on the more popular Annapurna Circuit and the trail now follows this classic trek in reverse as you pass through the steepest part of the Marsyangdi gorge. We follow Natural Annapurna Trekking Trails (NATT) on the west bank of Kali Gandaki away from the road on the other side of the valley. Our trek ends in Jagat as it is now possible to take jeeps from this village along the road to Besisahar. Overnight at Jagat, Included meals – breakfast, lunch, dinner. Day 17Jeeps to Besisahar then by private vehicle to Kathmandu. From Jagat we take jeeps along the road to Besisahar then switch to our private vehicles sent from Kathmandu to collect you. You will get back to Kathmandu in later afternoon. Overnight at Hotel in Kathmandu, (Meals: B). Day 18Departure day You are free to depart at any time. Transfer to the airport will be arranged for you. Included meals – breakfast. Trekking de Manaslu, excelente! 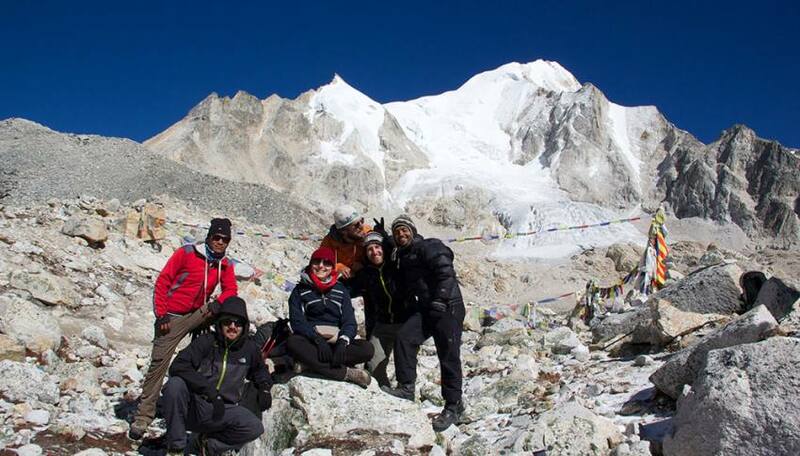 para repetir / Manaslu trekking, excellent! to repeat! Visitamos Kathmandu y hicimos el trekking de Manaslu con el guía Arjun de esta agencia, nos ha prestado todo el apoyo durante toda la subida a lo largo de dos semanas, excelente! Quiero volver y hacer otra subida a campamento base de Everest con el mismo guía, seguramente este primavera. Translation: We visited Kathmandu and did the trekking of Manaslu with the Arjun guide of this agency, he has lent us all the support during the entire climb for two weeks, excellent! I want to go back and make another climb to Everest base camp with the same guide, probably this spring. Arjun was our guide during our 10 day Manaslu trekking and incredible it was. He turned out to be an incredibly funny, knowledgeable and experienced guide! Arjun took great care of us as clients and made our trekking truly memorable! Definitely recommended if you go out hiking in Nepal!